Next Tuesday, April 9th, the House Judiciary Committee is slated to hold a hearing entitled, “Hate Crimes and the Rise of White Nationalism.” One would surmise hate crimes against Jews will be center stage given that for over two decades, Jews have been victimized disproportionately by such offenses, based upon hard FBI data (1996–2017). Moreover, despite much public hand-wringing about “Islamophobia”—notwithstanding 53 jihadist attacks which have caused 158 deaths in the U.S., since the cataclysmic 9/11/2001 jihad carnage, and zero, remotely comparable depredations by Jews—hate crime rates targeting Jews, between 2015 and 2017, remained 2.2 to 3.1-fold higher, relative to the rates of hate crimes against Muslims. Adding insult to the irony of perseverating on “Islamophobia,” or worse still equating it with Antisemitism, Jews are being subjected to a global pandemic of Muslim Jew-hatred, which includes the attitudes of U.S. Muslims. The Jewish community, which are direct victims and direct targets of these [Islamic religious] incitements are afraid to do something [i.e., about the religious incitement, specifically]. Not a protest, no public activity, nothing at all. They are afraid to be thought of as Islamophobic. …[T]he roots of this [Jew-hating] conversation are implanted in the communities and leaders of the [American] mosques. After many years of tracing the conversation in mosques [U.S., and globally] it is clear. This [incitement of Jew-hatred] is not an indirect response to what is happening around the world, but an organized effort to revert to the original Islam, that sees the Jews as infidels they [the Muslims] must fight and annihilate. These ideas are not preached to empty rooms. Al-Tayeb, in an interview that aired on Channel 1, Egyptian TV, October 25, 2013, gave a concise explanation of the continuing relevance of the Koranic verse 5:82 which has been invoked—“successfully”—to inspire violent Muslim hatred of Jews since the advent of Islam. It is also important to note that al-Tayeb was explicit in equating Zionism with Judaism, and Zionists with Jews. 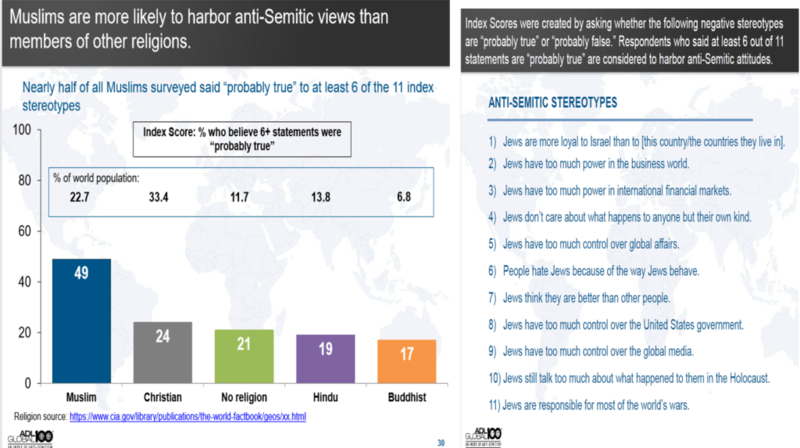 Based on 3,600 interviews conducted by the ADL in the U.S. in January and February 2017, and another 1,500 interviews in October 2016, 34% of American Muslims hold extreme antisemitic views (believe >=6/11 Jew-hating stereotypes), vs. only 14% of the general non-Muslim U.S. population. This relative 2.4-fold increased rate of extreme Jew-hatred amongst U.S. Muslims is very consistent with ADL’s global data on Muslims, although the absolute rates are, thankfully, lower across all American religious groups. The documented promulgation of canonical Islamic Jew-hatred in U.S. mosques (here; here; here), through early 2019, and Muslim primary and secondary schools (here; here), may have already contributed to sporadic violent acts (or attempted acts) by Muslims against American Jews (here; here; here). As Yigal Carmon has just prognosticated, should this traditionalist, mainstream Islamic Jew-hating incitement continue unchecked, it will eventually generate levels of Muslim antisemitic violence on par with those now occurring in Europe. Somali Muslim “apostate” Ayaan Hirsi Ali stands in striking contrast to the unrepentant, defiantly Jew-hating Somali Muslim Congresswoman Ilhan Omar. Ayaan’s genuinely contrite 2006 acceptance speech upon receipt of the American Jewish Committee’s “Moral Courage Award,” was an unabashed mea culpa for her former attitudes of Islamic Jew-hatred. She renounced, candidly, the “holy [Koranic] verses to support hatred of Jews …taught in the name of Islam.” Vanishingly rare displays of intellectual courage by Yigal Carmon, and Ayaan Hirsi Ali regarding the Islam in Islamic antisemitism, must become the rule. Otherwise, continued denial of Islam’s mainstream, canonical Jew-hatred, and the global Muslim attitudes it fosters, will have increasingly violent, even murderous repercussions for Jews.